ECU Joondalup under 18’s and 20’s but in great performances on Saturday and both came out with victories. The under 18’s broke a six game losing streak with a 3-1 win against Subiaco. Josh Carroll gave them the lead early, after good work from Kieron Craig. They wrapped up the points with two quick goals after half time with Craig and Corey Hyde scoring. The side have been playing some good football and Coach Dean Pickering said they were rewarded on Saturday. “Really happy for the lads, there could have been more but getting the three points and heading into this week with 2 games the boys are full of confidence and up for the challenge, but the win was just what we needed and what the players deserved after that past few weeks,” he said. 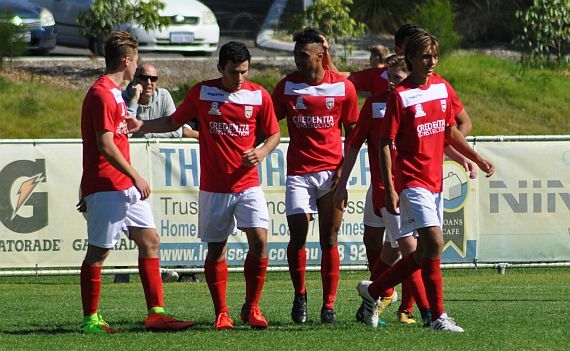 The under 20’s bounced back from back-to-back defeats to beat Subiaco 4-0. Keylun Pollard put the Jacks1-0 up after pouncing on a loose ball outside the box, he fired home and beat the keeper after a slight deflection. Pollard could have made it 2-0 soon after when he capitalised on a defensive error, beat two players but hit the post. They did make it 2-0 when Shakeel Alexander was put through one-on-one with the keeper after being played in by Marco Chadinha, and he lifted the ball over the onrushing keeper. It was 3-0 when Ethan Kerridge tap in at the back post from an in swinging free kick, before Pollard made it 4-0 smashing one in from just inside the box, beating the keeper at his near post after being played in by Liam Fyfe. Coach Mark Scanlan was happy with the performance and getting back to the winners circle. “After two defeats in a row the boys were eager to make amends and to go out and put on a good performance. In the first half we put on one of our best performances as a team, we moved the ball quickly and caused them a lot of problems,” he explained.